When I signed up for skydiving, I did face lots of criticism. I was told it is waste of money (not really- read this post), I was told it is not safe in India. But deep inside I knew that I had to give it a try and held on to my plan. I reached Mysore airport slightly ahead of time on Sunday, my schedule date for skydive. The Kakini enterprises (organizers of skydive) staff were yet to come. After few minutes of waiting, the staff arrived with their equipment and we cleared security checks. I was told my dive will be at 11AM. I was given a red suit to wear and I put it on and observed others rehearsing, getting ready and so on. Other than me there were two other enthusiasts who had come for static jump and 3 more army staff who had come for different jumps, paying out of their own pocket and during their leave. (I was under the impression that army staff may have skydiving as a part of their job description or optional facilities in their units to practice if they wish, but I was mistaken). Mysore airport has its lone flight of the day at about 10.30. A spicejet bombardier flies in from Chennai and flies back to Chennai. We observed that there were good no of passengers- probably 30-40 in number, good enough for a profitable flight. I was reminded of my previous visit to Mysore airport- during Kingfisher activation. There’re no proper refueling facilities in Chennai, so plane carries enough fuel to go back. 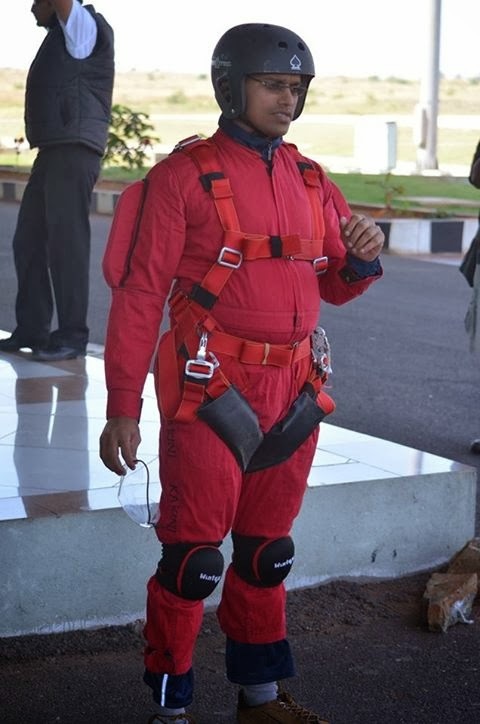 Skydiving staff need to coordinate with ATC while the spicejet is around. I had a few guests, whose entry got delayed as the check in of spicejet passengers were in progress. Eventually, after few hours of wait, they got in before my jump. Time went by and it was 12 noon and my turn was yet to come. In between, my instructor, Rajan briefed me on the procedure. As I was doing tandem, I didn’t have much to do, except following little instructions he gives. This is easier than static jump, which requires half day training and a written test, because in static the jumper controls the canopy and lands himself. Eventually my turn came, the last one for the day before they packed up. Myself, my instructor Rajan, another instructor Ales who would capture my videos and the pilot boarded the Cessna. I was given one quick rehearsal on exit procedure, pilot (Captain Harshit) took permission from ATC and the plane started moving. Our XL50 sorry Cessna 172 took close to 30 minutes to climb. It slowly circled Mysore airport thrice as it gained altitude. I enjoyed the view of airport and land behind, while we waited for the right altitude. I noticed a difference between altitude shown in plane’s altimeter and the one my instructor. When I questioned, I was told that plane’s altimeter gives height w.r.t mean sea level (which is higher) compared to wrist altimeter which was reset to zero on ground. The aircraft also makes insane noise, more audible because one of the door is cut off. It is not possible to make decent conversation on board. As we went up temperature dropped, but being midday, it was not too cold. Thankfully I was allowed to wear my spectacles, as we had another eye gear on top of it. Otherwise most of the time I will be asked to remove the specs (like when I took the ride at Tivoli Gardens) which means reduced vision. I could see the land deep below and told myself that it will be an easy jump. I reminded myself that all I need to do was to just trust my instructor and not panic or do anything stupid. Go pros and cameras were turned on, we inched out of the aircraft slowly, with my right leg out first, right hand next and then positioning myself under the instructor. Next few moment I was hanging off my instructor, my legs folded and my hands close to my chest, away from the aircraft wing support. Next thing I know is we were in free fall. I stopped thinking, held my breath and enjoyed the fall. Gravity defying 35 seconds of drop vertically down, from 10000 ft to 5000 ft. In between we managed a small stunt as well-extending our arms to hold a formation with my secondary instructor. In fact I was few seconds late in stretching my arms, else probably we could have had more fun. Then the canopy was deployed and our decent slowed down heavily. Now we were floating around in a relaxed mode and my instructor thought me basic maneuver of the parachute- how to steer it left, right etc. We did some circling and slowly touched down at the designated spot. Now that I am done with tandem, thinking of doing a static jump next. Disclaimer: I didn’t click the images in this post. They were taken using a go pro by a fellow instructor who jumped with us. But since I have paid for the shoot, I can claim to own the photos. Wow, superb set of photo series..
wonderful photos..... I was little scared when I saw last 4 photos. seems skydiving is really a nice experience. cool!!!! I enjoyed looking at your photos, though this is something I will ever have courage enough to try out myself! Congratulations Shrinidhi! Now when are they coming to Delhi? Hi,,, I have done the sky diving in Melbourne, based on that experiences. Need to improve on safety. For example: i have jumped directly from the door, i have not done any kind of circus coming out sitting bar settling there & jump. If you have videos kindly compare u will see driffence. @ Farhaan: What is coming soon? How did you pay? Online transfer?